Let’s hear it for functional families! Home / 2010 / November / 30 / Let’s hear it for functional families! Well I didn’t have to cook for three days straight, but I can count on one hand the times I got to sit down and breathe on Thanksgiving Day! 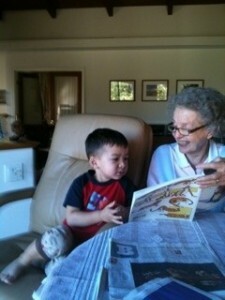 The 2.8 year old great grandchild going on six, stole the show, as did his dad’s turkey egg roll appetizers. I feel so lucky merely to have a family to report to and follow the aging process with. Especially an honestly loving one like Larry’s was. His dad died almost two years ago at 89. His 84 year old mom is a born-to-be-caretaker product of the 50’s, who still prefers to wash dishes in rubber gloves than use a dishwasher; but bless her. A sixty-one year marriage is something I don’t know how to do! Love and saying it out loud is the Kingsland’s middle name. Let’s hear it for Maxine whose unconditional acceptance of her children remained strong and visible through their variety of lifestyles and marriages. She’s exceptional. It’s hard to count what with all the step children that entered along the way; but she’s had four children, seven grandchildren, and now seven great grandchildren in her direct gene pool, not counting nine non-biological great grand-descendents. Larry’s mom still sends birthday cards with money in them to two of Larry’s brother’s ex-wives, and me Larry’s third wife of 16 years. Thank you god, for finding me a functional family (well there were some drawbacks to always being ‘nice’ in L’s upbinging), to end my years connected to. May the blessings of the season rain (or snow) down upon you all.